Good mental health is defined by the World Health Organisation (WHO) as “a state of well-being in which every individual realises his or her own potential, can cope with the normal stresses of life, can work productively and fruitfully, and is able to make a contribution to his or her community”. This is a basic requirement of the society which we live in today. Even so, looking after your mental health may be the last thing on an individual’s mind. 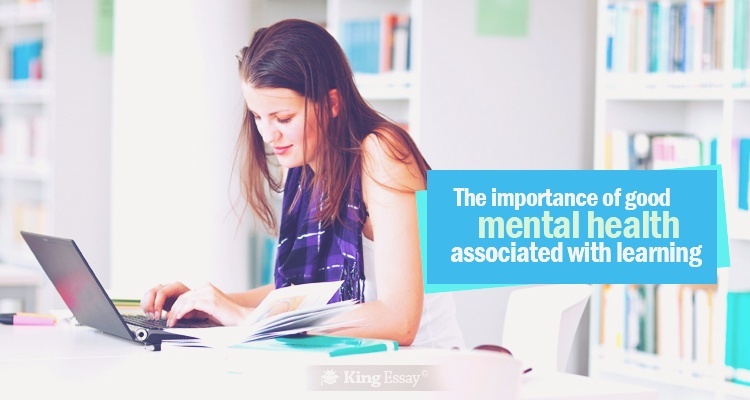 For students there should be an additional importance to mental well being. Their academic success lies in the ability to grasp the ideas and concepts imparted to them by their teachers and instructors and their ability to replicate those theories in a custom essay. To understand its importance and how to improve mental health there are some steps which you can take on a daily basis. Let’s look at some tips for the improvement of memory and to impart good mental health. Self Image: This is how you picture yourself in your mind. Some people always think of themselves as a winner while others are not so positive. Never let anyone break your self image. Remember that failure and defeat is an event and not a person. Don’t lose hope, no matter what the consequences. Physical Fitness: Try to keep yourself as physically active as you can. Avoid becoming a couch potato. Getting 10 to 15 minutes exercise daily has much more positive effects than exercising for an hour once in a week. Eat healthy foods and drink lots of water in the course of the day. Try to refrain from smoking, see Tobacco Cessation: You can quit! Get a good amount of sleep at night every night. Social Life: Your friend’s circle has a huge impact on each and every decision you make. Some decisions may be crucial such as which university to go to or which major to pursue. What is more important is that you surround yourself with positivity and optimistic people. Enjoy public events with your friends and family to keep yourself entertained and feeling fresh. Managing Stress: There will be traffic jams, long lines at shopping centres and the pressure of meeting short deadlines for that leadership essay project. You will have to deal with everything. Everyone has their own way of self motivation and managing stress, meditation, keeping a daily journal, listening to music or enjoying sports. Find something which you find relaxing and which is convenient for you. It could be spending some time at the swimming pool or playing pool with some close friends. Setting Goals: Know what you want to be and set pragmatic academic and personal goals. What do you need to do tomorrow, a week from now or a year from now? Picture yourself achieving all of your objectives. It will be much easier to maintain composure when you understand the driving force behind each and every one of your actions. Spending Time Alone: Spending some time all alone is a great way to relax. You can go to a park or have some ice cream, anything on the spur of the moment which you think will help you calm down. You can even watch the stars in the night time sky to realise the soothing effect which they have on your nerves. It is important to mention that some people have suicidal tendencies when they are alone. For them it is better to avoid being isolated. Do not Binge: An excess of anything can cause harm. This is the easiest way to lose control. Eating too much or drinking too much is never a good idea. Sleep: This is one of the most important aspects of a spiritual well being. Find out how much sleep you really need and schedule it in.